This is one of the most talked topics in the forums and bloggers who are using AdSense to monetize their blog. 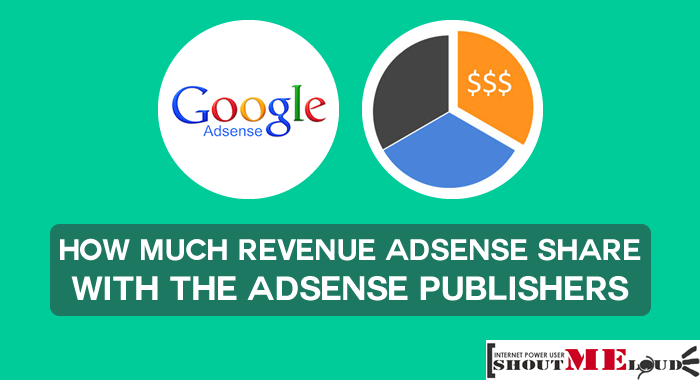 Till now very few publishers were aware of the percentage of revenue AdSense share with the publishers. Today in an official announcement AdSense team revealed the exact detail on percentage of revenue they give to publishers. Here I have summarized the announcement so that you would know the revenue sharing between AdSense & you for different ad types. AdSense for content: AdSense for content is most widely used advertisement inventory from adsense. One of the major reason is it’s contextual advertisement, which helps in getting better CTR. AdSense revealed they pay 68% of revenue to their publishers and rest 32% they keep to maintain and development of new technology. This 68% seems to be fair to me. Adsense for Search: For people using AdsSense for search, Google AdSense pays you 51% of rev share. This seems low to me, but I would love to know your … [Read more...] about How Much Revenue AdSense Share with the AdSense Publishers? Social Bookmarking Icons: How much is enough? Social bookmarking and sharing buttons are very useful for every blogger like you to get extra traffic to your blog post. This helps your readers to share quickly and bookmark the article. In the past couple of years, there has been a lot of change in the social media landscape, and now Social signals are an important part of search engine ranking. If this sounds something new to you, here are guides which you should read right away: I have already emphasised on putting up Social sharing buttons either in floating manner or at the end of every blog posts. For WordPress, we have plugins like Monarch or Jetpack, which quickly add these buttons. One mistake which I have seen many of you make is, by adding a big list of social bookmarking icons and this article points out things which you should and shouldn’t be doing with these buttons. Last night I was reviewing my client blog and one thing in particular caught my eyes, and that is the number of social bookmarking icons he was … [Read more...] about Social Bookmarking Icons: How much is enough?